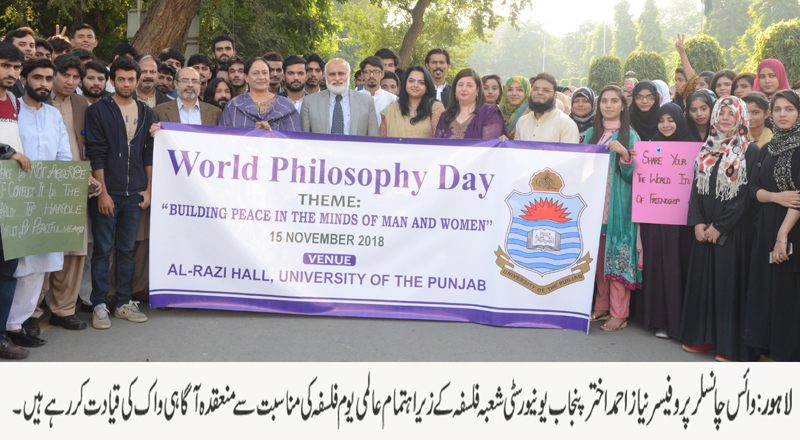 LAHORE: (Thursday, November 15, 2018): Punjab University Department of Philosophy took out awareness rally from undergraduate block to VC office to mark World Philosophy Day. Punjab University Vice Chancellor Prof Niaz Ahmad Akhter, Registrar Dr Muhammad Khalid Khan, Chairperson Dr Shagufta Begum, Assistant Professor Shahid Mehmood Gull, faculty members and a large number of students were present on the occasion. The participants were holding placards highlighting the importance of philosophy.